A conversation about golf Friday afternoon with 7-year-old Alexandra Phung detoured to one of her other favorite subjects, chess. That, golf fans, is like going through Amen Corner a couple under par. Alexandra will be going for a crown of another kind in the Girls 7-9 division of the Drive, Chip and Putt National Finals Sunday morning. Six – two drives, two chips and two putts – will be the key number as she competes against her peers at Augusta National. Alexandra Phung in the Girls 7 - 9 division chips during the Drive, Chip and Putt National Finals at Augusta National Golf Club, Sunday, April 7, 2019. That usually isn’t a problem for the precocious second-grader at the Talented and Gifted School for Young Scholars in Harlem, not far from the family’s home in Forest Hills, N.Y. Introduced to golf and chess about two years ago by her father, Alexandra excels at both pursuits. She currently is second in the Girls 7 and Under ratings of the U.S. Chess Federation and will compete in the All Girls Nationals next week. Alexandra’s sister, Amelie, 11, who was her inspiration to take up golf, also is nationally ranked in chess. Their brother Leo, 13, dances with the New York City Ballet. Alexandra’s chess participation led to a friendship with a volunteer coach, Ben Foley, who is disabled. With guidance from their father, an engineer and inventor, the Phung sisters are designing a golf club for Foley so he can enjoy a sport they love. Weakened by an intestinal virus last fall on the weekend of the Drive, Chip and Putt regional at Winged Foot Golf Club, it looked as if Alexandra wouldn’t be able to compete. But after encouragement from Amelie, who was entered in the Girls 10-11 division, Alexandra played through her illness to medal in putting and win her division by 10 points. Alexandra Phung in the Girls 7 - 9 division looks on after driving during the Drive, Chip and Putt National Finals at Augusta National Golf Club, Sunday, April 7, 2019. 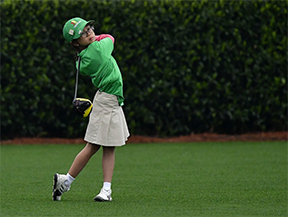 Her mother, Jenny, a pharmacist, Amelie and Leo, and Bob Bigonette, lead instructor at the Michael Breed Golf Academy, will be rooting Alexandra on at Augusta National as she takes another step in life.